Ayyam Gallery London is pleased to announce Seduction, Iranian artist Afshin Pirhashemi's first UK solo exhibition.This exhibition features Pirhashemi's signature black and white paintings depicting thickly tressed women in the guise of temptress, seductress, repentant, as well as those ultimately beyond redemption.In a departure from his monochromatic canvases of late, the artist also presents two striking large-scale works in colour. 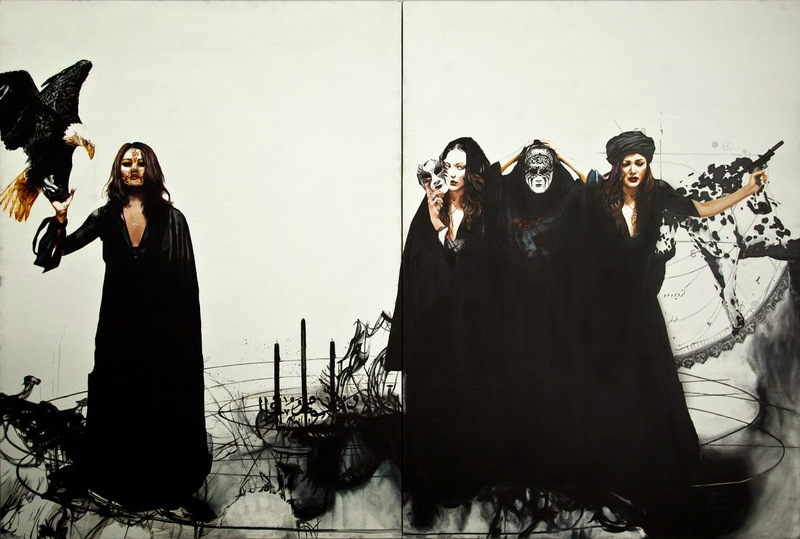 In this series, the women are partially veiled or wrapped in chadors, while at other times they announce their love for the United States, signalling the dichotomy of identity that modern day Iranian women confront on a daily basis.These women long to align with the West, yet at the core are also linked to local identity in dress and social expectation in the domestic sphere. The intensity reached in these new canvases surpasses the already heightened feelings created by Pirhashemi's previous monochromatic works.Further, the insertion of colour such as chestnut and copper into the hair of his deadly heroines and the symbolic eagle as violent bird of prey imbue the works with a ferocity, blood, lust and vigour that is contrasted with the morbidity and doom of black in which the women are usually cloaked.